Trailer For IFC Midnight's RUST CREEK Is Within! 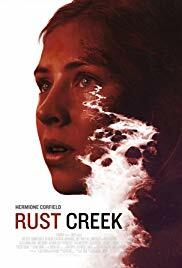 Get ready for the new year will be bringing the new thriller from IFC Midnight and director Jen McGowan titled RUST CREEK. The movie takes a look at a situation that none of us ever want to be in. The official trailer can be viewed below. RUST CREEK stars Hermoine Corfield and Jay Paulson. "Sawyer, an ambitious, overachieving college senior with a seemingly bright future. While on her way to a job interview, a wrong turn leaves her stranded deep in the frozen Kentucky woods. Though she’s not sure she can trust him, Sawyer must take a chance if she hopes to escape Rust Creek alive." IFC Midnight will release RUST CREEK into theaters and VOD January 4th.